On Thursday 4th October, took place in Funchal, Madeira, hosted by Escola Dr. Horacio Bento de Gouveia, the first multiplier event of Ethicsboard, one of the most important projects supported by European Projects Association asbl. Innovation in teaching, collaboration among schools and local entities, global opportunity platforms for young people were the main issues of the Seminar. On 10th October, we attended to one of the most interesting event organised during this #EuropeanWeekofRegionsandCities: “ Collective impact for young people’s #TransitionToWork. This session – really quite close to our project – analyzed the concept of Youth Unemployment, examining in particular the Young peoples’ transition from education to employment. The main subject of the program was the “ StartNet project “, a project that presented innovative examples from different regions to inspire practitioners and policy-makers using #CollectiveImpact, as a successful method for young peoples’ #TransitionToWork. But what does it means? What are the differences with the “Hard Skills”? In this article we are going to understand the meaning of those terms. First of all, we need to define the notion of Hard Skills: The Hard skills are the ability that we learn through education, training programs, certifications etc. They concern skills that generally are easily quantifiable and measurable. For example, an hard skill for a software engineer might be computer programming. The Hard Skills are the first factors that your potential boss notes during an interview. Even so, they are not the only ones: there are others elements that your boss will analyze, that could be more important than all your education and all your certifications, the soft skills. Soft Skills are the personal attributes, personality traits, communication abilities. Such abilities are necessary to obtain the job and especially to maintain it! isn’t capable to carry out his job, or an employee less prepared but full of soft skills, smart, understanding, charismatic? Obviously, these abilities are much harder to measure and evaluate, but above all… to gain. They also include: attitude, creative thinking, teamwork, networking, decision making etc. All skills that nobody learns at school, that do not depend on education, but that are at the same time key issues in order to be competitive in the labour market. Do you have soft skills? Have a look in our online platform, in section “ complete your profile “ you will find a full list of abilities that could describe yourself. On 11th April, EPA – European Projects Association asbl organized its most exciting event in the first half of 2018 “European Talented Initiatives – challenges and opportunities”. In collaboration with ALDE, the event has been organized at the European Parliament by EPA’s Secretary General Frederic Fabre, and facilitated by Out Of The Box International CEO Marko Paunović, within the framework of Erasmus+ co-funded project ‘Talented Europe’. “European Talented Initiatives – challenges and opportunities” event has been dedicated to discussing how the regional perspective could influence success of young talented people in Europe, and how regional development funds along with other EU funding mechanisms could approach this issue, during which, our speakers Ivan JAKOVCIC, Sergio DELGADO QUINTERO, Marko PAUNOVIC, Louis DELCART, Marcin PODGORSKI, Diana FILIP, and Peter BAUR shared their project findings. Moreover, to engage both panellists and participants into discussion, the event has been used to introduce findings of the project ‘’Talented Europe’’, during which Marko Paunović presented three winners of the “Out Of The Box” awards to honor innovative ideas promoting the European dream. All recommendations discussed and given throughout the event are now currently being incorporated into a report “New ways to support Talent around Europe’’, with the purpose of providing fresh ideas on how political actors could address youth issues in the light of European Parliamentary elections in 2019. 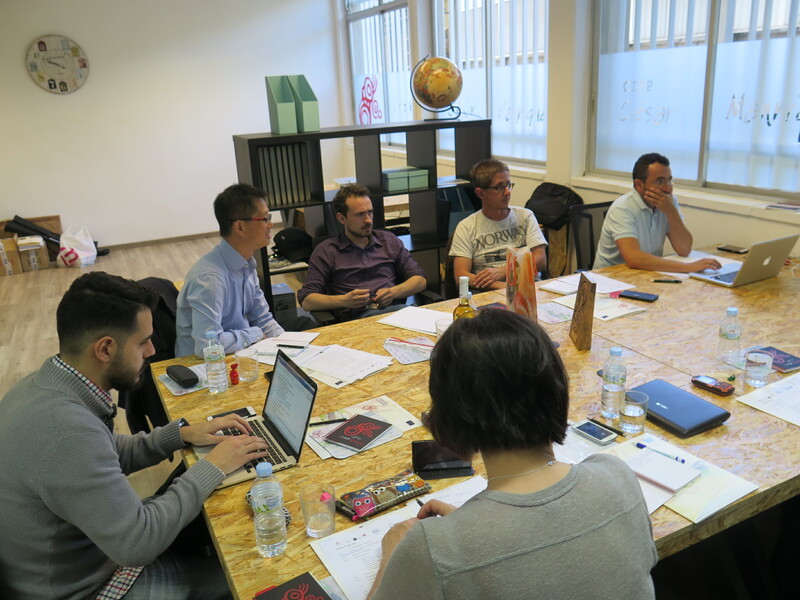 The 10th and the 12th April 2018 took place in Brussels the sixth Transnational meeting of Talented Europe. The said meeting was hosted by the European Projects Association in its headquarters. All the other partners were attending: CIFP Cesar Manrique-Alumnos, IES Puerto de la Cruz, Technical University of Košice and the Out of the Box International. During this meeting, the partners have been debating on the project’s evolution, the Dissemination plan, the recruitment analyses, the Social Networks strategies and other key points of the above project like the budget. This has enabled them to review and re-adapt their strategies in order to ensure the maximum performance of Talented Europe. Great public success for the Career Day in Brussels attended by Talented Europe! 1) Companies, with internships and full-time positions in various sectors, including marketing and sales, e-commerce, consumer goods, food & beverage, banks and financial institutions, insurance, tax advice, no profit. The Career Day of Brussels is the most important meeting point between the Universities and the world of work. Two days of intensive orientation, debates, workshops, and discussions with private companies and European Institutions delegates thanks to which graduate and undergraduate students of the University can focus on the best paths to define and achieve their professional goals. As well Universities delegations, for who was interested in continuing the study paths to Masters Degree and PhD’s. Some of the most popular and highly valued Universities from all over Europe available for one-to-one meetings. It was thanks to these meetings that Talented Europe Team presented the idea of the platform and created new partnerships with some of the most important Universities in Europe. Participants, in addition of being involved in the exhibition space, took part in different seminars. The students were also able to participate in various “training” activities. We hold one of the seminars and informed the students about the Talented Europe online platform and the advantages of using it. Talented Europe team presented the Universities network part of our platform and the companies involved. More than 50 leading companies register from all over Europe, that are willing to hire young motivated talented students. Foster the awareness of students (graduates and undergraduates) about their skills and competencies; to understand in which areas they can be applied and, above all, to transform them into transversal, technical/professional skills and help them find their real talent. After the presentation, we replied to the different questions from by the students, who were enthusiast about the opportunities presented. Specific dissemination material was distributed to the Universities, Companies, and students. At the end of these 2 days activities, we are happy about the enthusiasm transmitted to the students and for the extension of our Universities network! Talented Europe’s Blog has been updated. Over the last several months, we have been working on our Erasmus+ KA2 project’s blog, Talented Europe. The main outcome of the project is a multiplatform application, online/onphone ‘app’. Our goal is to match top students to job and internship opportunities across Europe. Now, after all of the hard work and hours spent in gathering information, we are pleased to announce that Talented Europe’s blog has been updated. In fact, you can now be informed of all stages of the project and about the past and upcoming transnational meetings and events.